The Washington Redskins football team will be the target of a pre-game radio campaign by an American Indian tribe from upstate New York. On Thursday, the tribe said the add campaign will press the team to change it's eighty-year old nickname, which many consider racist and a historical anachronism. The Oneida Indian Nation said the first ad will run on radio stations in Washington before the team hosts the Philadelphia Eagles in its season opener Monday night. In the ad, Oneida Nation Representative Ray Halbritter says NFL Commissioner Roger Goodell should "stand up to bigotry" by denouncing "the racial slur" in the team's name. "We do not deserve to be called redskins," the Oneida leader says in the ad. "We deserve to be treated as what we are – Americans." The radio ad said Goodell had rightly been critical this summer after an Eagles wide receiver was caught on video making a racial slur against African-Americans. The ads launch as the Washington Redskins this year face a fresh barrage of criticism over their nickname, with local leaders and pundits calling for a name change. 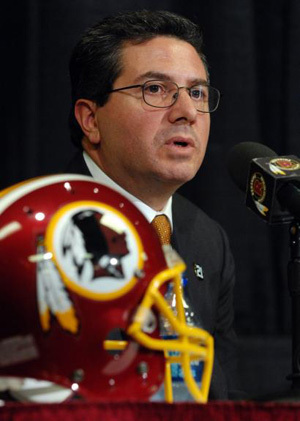 In May, 10 members of Congress sent letters to Redskins owner Dan Snyder and Goodell urging the team to change the name. Snyder has vowed to never change the name. League spokesman Brian McCarthy, in an email to The Associated Press, said they "respect that reasonable people may have differing views." "The name from its origin has always intended to be positive and has always been used by the team in a highly respectful manner," McCarthy wrote. There was no immediate response from the Redskins. The Oneidas have been vocal opponents of the Redskins nickname - be it for NFL or high school teams. The tribe, which runs a casino and resort in central New York, this year gave $10,000 toward new jerseys to an area high school that changed its nickname from the Redskins to the Hawkeyes. The Oneida said the first ad will run Sunday and Monday on several stations in Washington. Subsequent ads will run in Washington during home games and in the cities hosting the team when it is away. A spokesman for the Oneidas would not say how much the campaign would cost beyond "multiple thousands." Halbritter said that fans also are being urged to lobby the NFL in support of the name change at changethemascot.org , a website that debuted Thursday. "We believe that with the help of our fellow professional football fans, we can get the NFL to realize the error of its ways and make a very simple change," Halbritter said in a prepared statement.